During the summer vacation season, car traffic to and on Cape Cod is often intense, with hour-long delays. Plan your driving strategy carefully! The two graceful bridges spanning the Cape Cod Canal and connecting Cape Cod to the mainland (map), Sagamore Bridge to the northeast and Bourne Bridge to the southwest, were built during the Depression in the 1930s. They were fully sufficient to carry all the traffic back then. Now, they act as a useful bottleneck to keep all but the truly committed from reaching the Cape. In the summer months, avoid driving to Cape Cod (and trying to cross the bridges) on Friday between 2 pm and 9 pm (14:00 and 21:00), and on Saturday between 8 am and 2 pm (08:00 and 14:00). On Sunday afternoon and evening from 3 pm to 10 pm (15:00 to 22:00) traffic leaving Cape Cod across the bridges is slow. By the way, if you see bumper stickers advertising the Cape Cod Tunnel, you should know that it's a joke! Anyone ever caught in the traffic jams coming to or going from Cape Cod dreams of a big, fast tunnel under the Cape Cod Canal to speed traffic along, but there is no such tunnel, and there may never be. As for the small campaign to fill in the Cape Cod Canal so that highways can easily extend to the Cape, it is a formula for assuring that every street on the Cape becomes part of New England's largest traffic jam. Take I-195 to MA 25/28 South and cross the Bourne Bridge if you're heading for Falmouth and Woods Hole. If you're going to Sandwich, Hyannis, or other Cape points, don't take the Bourne Bridge, but take US 6 East just before the Bourne Bridge, and this will take you north and east to the Sagamore Bridge, where you cross the canal. The Southeast Expressway (I-93) will take you right to MA 3, which goes straight to the Sagamore Bridge. If you're on your way to Falmouth and Woods Hole, stay on I-93 past the intersection with Route 3 and take Exit 66 for Route 24 South, then I-495 South MA 28, before taking you right over the Bourne Bridge. 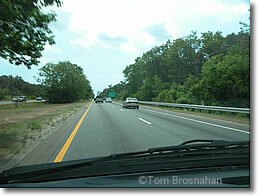 Above, speeding eastbound along the four-lane Mid-Cape Highway (US 6) toward Hyannis, Chatham and Orleans.